Woman taking bath and blowing on foam in her bathroom. Brunette young woman taking hot relaxing bath and blowing on foam in her bathroom. Woman Taking Bath And Blowing On Foam In Her Bathroom. Brunette young woman taking hot relaxing bath and blowing on foam in her bathroom. Beautiful girl blowing on foam in bath tub. Brunette young girl taking bath full of foam in bathroom. Blow bubbles from foam. Bathtub. beautiful woman with towel on her head, taking off her black dress in the room. Cheerful lovers are having fun in jacuzzi, attractive girl is putting soap foam on her boyfriend's beard and laughing. Romantic relationship, wellness and happy people concept. Brunette young woman taking a bath and blowing on foam in her bathroom. Brunette young woman taking a bath and blowing on a lot of foam in her bathroom. Brunette young woman taking hot bath and wash sholder on foam in her bathroom. Brunette young woman taking hot relaxing bath and do scrub on foam in her bathroom. 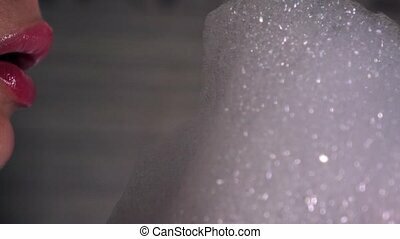 Bubble bath for woman taking and blow on foam and wash legs in her bathroom. Dolly system.